In case you missed it here are some of the many inventions to emerge from South Africa over the years. The items featured here are extracted from the book, Great South African Inventions. Ferdinand Chauvier was a hydraulics engineer who came to South Africa from the former Belgian Congo in 1951. 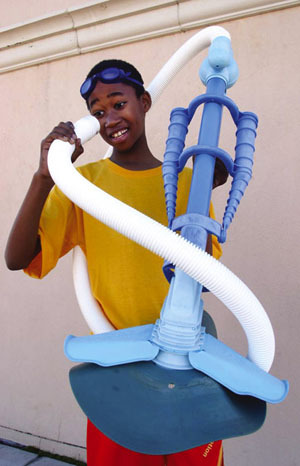 Realising that there was a huge market for equipment that would eliminate the physical labour from swimming pool cleaning, he invented the first commercially successful pool vacuum cleaner, the Kreepy Krauly. He began developing a machine that would do the job automatically, using the pool filtration pump as a power source, and the product made its debut in 1974. Cape Town. Docks. Harbour. Breakwater. Dolos. 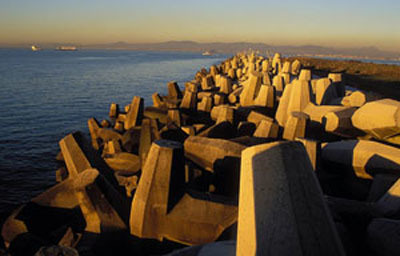 In 1966, Merrifield instructed Krüger to design a concrete structure that could protect the East London harbour breakwater. After brainstorming some ideas with colleagues, Krüger went home and assembled a temporary structure using broom handles and string. His prototype dolos looked like an H with one leg turned through 90 degrees. It was named after the knuckles of a sheep, which it resembled. Merrifield liked Krüger’s idea and asked him to develop the design further. Soon, full-sized dolosse were cast in concrete and successfully placed along the seaward edge of the breakwater in East London, where they dissipated the power of the waves with signal success. Trevor Wadley was a highly inventive man who became famous for his inventions of radio equipment. 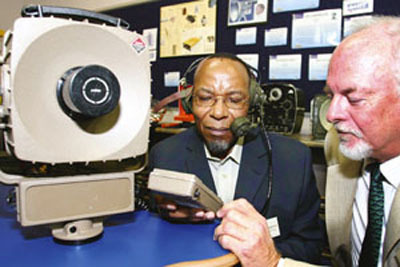 He joined the Tele-communications Research Laboratory (TRL) of the Council for Scientific and Industrial Research (CSIR) in Johannesburg in 1946. Here he perfected one of his earliest inventions, the Wadley Loop, a unique circuit for cancelling frequency drift. But the invention that made Wadley world famous was the Tellurometer, a very accurate tool for measuring distance. Challenged to develop an instrument that could be transported easily and measure with an accuracy of 1:100 000, Wadley set to work – and succeeded in less than six months. His amazing invention, the Tellurometer, measured the travel time of a radio wave from one transmitter to another to an accuracy of 3:1 000 000 over a range of 3 to 50 km. Wadley received widespread praise for his device, which he demonstrated in South Africa, England and elsewhere, and British Prime Minister Harold Macmillan was so impressed that he is said to have asked aloud why British scientists had not come up with something similar. In a famous incident, Wadley shocked scientists in England by showing that the measured distance between two points on Salisbury Plain was out by 1,5 metres. This was especially significant because Salisbury Plain was used as a baseline for British surveying. The invention of the X-ray computed tomography (CT) scanner was a combined effort by the British electrical engineer, Godfrey Hounsfield, and South African physicist Allan MacLeod Cormack, who was based in the United States. Interestingly, the two men worked separately on the development of the invention, and the only time they ever met was at the ceremony in Oslo in 1979, when they shared the Nobel Prize for Medicine. Cormack worked in the famous Cavendish Laboratory at Cambridge University, England. He took a temporary post at Cape Town’s Groote Schuur Hospital; at the time, he was the only nuclear physicist in South Africa. In 1957, he developed algorithms that used information from X-ray “slices” of a patient’s body to create a tomographic (or 3D) image of the whole body. These reconstructions were the first computerised tomograms ever made – although his “computer” was a simple and woefully inadequate desktop calculator. Godfrey Hounsfield came to the rescue, developing a method of his own for computerised tomography. He constructed the first practical scanner, which was designed to examine the head. When it was first tested in 1972, this scanner provided doctors with the first 3D look inside the human body. His book, The Art of Tracking, traces the origins of tracking as a science, providing an overview of the indigenous knowledge used in tracking and the practical ways in which they are used. But Liebenberg wanted to go a step further; he wanted to record the knowledge of San trackers so that their methods could be used to track game animals and learn more about wildlife behaviour and management. In 1996, after experimenting with a variety of technologies, he and a colleague, Justin Steventon, conceived the Cybertracker – a palmtop computer with a built-in global positioning system (GPS). Instead of recording the information in text, they used a series of icons (small diagrams of animals) to represent game species, their tracks and other information. 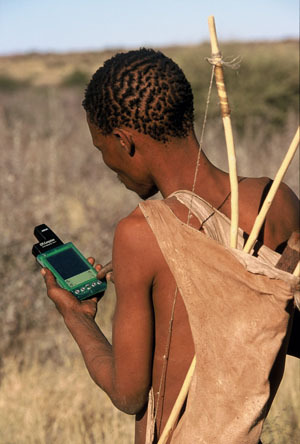 San trackers, who are very skilled but cannot read or write, are able to store and access information on the device. This includes how many species the trackers see, and where. It records the habitat of the animals, the number of males, females and young in a herd; how, when and where the animals feed and what they do to mark their territory. If the baby’s heart rate slows during a contraction, this is a sign that it is not receiving enough oxygen, and could die. 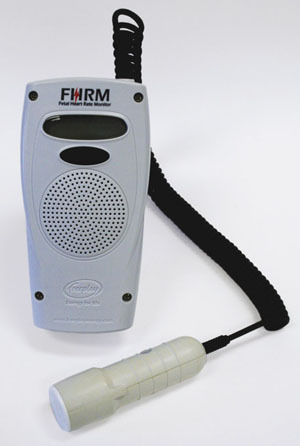 The heart rate signals are shown on an LCD monitor and are also played through built-in loudspeakers. Although sophisticated heart rate monitors are widely available in developed countries, they tend to be expensive and fragile, and need batteries. This device, on the other hand, employs wind-up power, solar power, rechargeable batteries or mains power, and can be used anywhere. 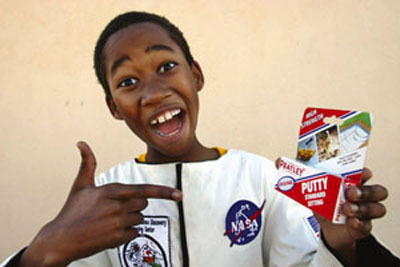 The inventor of Pratley Putty is the late George Montague “Monty” Pratley. After the death of his father, he used his inheritance to study at Rugby College of Technology and Arts in England, later working on the Whittle jet engine. Monty was a man with tremendous faith in his ability to succeed; failure was not part of his vocabulary. On his return to South Africa in 1948, he started the Pratley Manufacturing and Engineering Company, working from a rented garage in Roodepoort. He invented Pratley Putty in the early 1960s while trying to develop a glue and insulator that would hold components together in an electrical box. As time went by, many other uses were found for his mouldable epoxy putty, which at the time was regarded as a “space age” product. Today, the company bearing his name employs over 250 people and manufactures more than 800 products. The narrow-gauge railways of southern Africa were slowing down railway development; a solution was needed. The person who provided it was a mechanical engineer, Dr Herbert Sheffel, who worked in the rolling stock design section of the South African Railways (SAR). Sheffel realised that he could solve the problem if he redesigned the suspension of the bogie, the four-wheeled undercarriage at either end of a railway coach. During the 1970s, he invented a new, stable bogie. Instead of a rigid design with a rectangular chassis, he designed a flexible “cross anchor” bogie with high wheels that allowed the inner and outer wheels to make room for each other on curves. It also reduced the lateral forces that produced vibrations.The Sheffel Bogie was introduced to the SAR fleet of ore wagons from 1975 onwards and proved to be a great success. Dr Percy Amoils, an orthopaedic surgeon and business person, invented the Cryoprobe – a pencil-shaped device with a frozen tip used for eye surgery. When he demonstrated his invention to an excited audience at Oxford University in England in 1965, he was still a young, unknown doctor. Ten years later, he won the Queen’s Award, and soon afterwards, was recognised with the Medal of Honor by the US Academy of Applied Science. The Cryoprobe works by freezing gas that is released from a small nozzle under high pressure in a closed tube. As the gas expands, the temperature of the probe’s tip drops to minus 80º C. When the probe is inserted into a cut in the eye and the gas is switched on, it freezes to a cataract, which is then removed. Cryoprobe treatment was used in 1983 to cure former British Prime Minister Margaret Thatcher of retinal detachment after unsuccessful laser surgery. Amoils is also famous for treating ex-President Nelson Mandela for eye cataracts the day after he was sworn into office. Afterwards, Mandela was able to read a speech at the United Nations without spectacles.